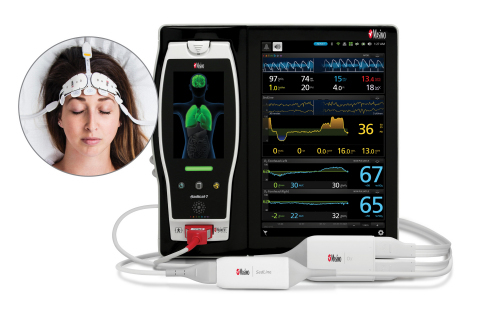 NEUCHATEL, Zwitserland (BUSINESS WIRE) – Masimo (NASDAQ: MASI) kondigde vandaag de resultaten aan van een studie, onlangs gepubliceerd in Anesthesia and Intensive Care, waarin onderzoekers van het Austin Hospital in Melbourne, Australië, probeerden de cerebrale zuurstofvoorziening te meten van een grote groep gezonde vrijwilligers, gebruikmakend van de regionale Oximetrie van Masimo O3®, om een normaal waardenscala vast te stellen en de relatie tussen hersenoxydynamische zuurstofvoorziening en andere lichamelijke en hemodynamische karakteristieken te onderzoeken1. O3 gebruikt near-infrared spectroscopy (NIRS) om de cerebrale oxygenatie te monitoren in situaties waarin perifere pulsoxymetrie alleen mogelijk geen volledige indicatie is voor de zuurstof in de hersenen. NEUCHATEL, Switzerland–(BUSINESS WIRE)– Masimo (NASDAQ: MASI) announced today the findings of a study, recently published in Anaesthesia and Intensive Care, in which researchers at Austin Hospital in Melbourne, Australia sought to measure cerebral oxygenation in a large cohort of healthy volunteers, using Masimo O3® Regional Oximetry, to establish a normal range of values and investigate the relationship between cerebral oxygenation and other physical and hemodynamic characteristics.1 O3 uses near-infrared spectroscopy (NIRS) to monitor cerebral oxygenation in situations in which peripheral pulse oximetry alone may not be fully indicative of the oxygen in the brain. This press release includes forward-looking statements as defined in Section 27A of the Securities Act of 1933 and Section 21E of the Securities Exchange Act of 1934, in connection with the Private Securities Litigation Reform Act of 1995. These forward-looking statements include, among others, statements regarding the potential effectiveness of Masimo O3®. These forward-looking statements are based on current expectations about future events affecting us and are subject to risks and uncertainties, all of which are difficult to predict and many of which are beyond our control and could cause our actual results to differ materially and adversely from those expressed in our forward-looking statements as a result of various risk factors, including, but not limited to: risks related to our assumptions regarding the repeatability of clinical results; risks related to our belief that Masimo’s unique noninvasive measurement technologies, including Masimo O3, contribute to positive clinical outcomes and patient safety; risks related to our belief that Masimo noninvasive medical breakthroughs provide cost-effective solutions and unique advantages; as well as other factors discussed in the “Risk Factors” section of our most recent reports filed with the Securities and Exchange Commission (“SEC”), which may be obtained for free at the SEC’s website at www.sec.gov. Although we believe that the expectations reflected in our forward-looking statements are reasonable, we do not know whether our expectations will prove correct. All forward-looking statements included in this press release are expressly qualified in their entirety by the foregoing cautionary statements. You are cautioned not to place undue reliance on these forward-looking statements, which speak only as of today’s date. We do not undertake any obligation to update, amend or clarify these statements or the “Risk Factors” contained in our most recent reports filed with the SEC, whether as a result of new information, future events or otherwise, except as may be required under the applicable securities laws. Nieuwe studie onderzoekt het nut van Masimo SedLine® Patiënt State Index bij het monitoren van de anesthesiediepte van patiënten met gezonde en circrotische lever.